Even as cryptocurrencies proliferate, there is significant debate about what exactly cryptos are. Central bankers around the world seem to be reaching a consensus that crypto is money. That’s a significant development. Many see the likelihood, that based on the intrinsic qualities of digital assets and the various solutions that they tend to offer to the fintech industry, crypto assets could one day reduce demand for central bank money. This view recognizes an important difference between cryptos and traditional forms of money. Central banks emerged to introduce a relationship based on credit between the central bank and citizens who wanted to use cash, and between the central bank and commercial banks which used reserves to facilitate business. Crypto assets are bringing a new narrative to the concept of money. Rather than credit relationships, crypto assets are a representation of a kind of commodity money. The IMF believes that crypto assets could reduce demand for central bank-issued currency. There have been criticisms about cryptocurrencies in their capacity to function as a dependable medium of exchange. According to He, for the time being, crypto assets are too volatile and too risky to pose much of a threat to fiat currencies. He also notes that they do not enjoy the same degree of trust that citizens have in fiat currencies. The lack of trust is related to the fact that there have been cases of fraud, security breaches, and operational failures. Plus, cryptos have been associated with illicit activities. The situation is not hopeless for crypto assets as technological innovations and continuous development could go a long way in addressing the deficiencies. That’s one reason the IMF Director, He, believes that central banks must learn from how crypto assets are used in order to fend off the competitive pressure from crypto assets. Apparently, the reality of the existence of cryptocurrencies and the solutions that they bring is becoming more acceptable. Rather than the fierce resistance and negative energy that existed between the crypto advocates and traditional institutions, there appears to be an increased level of acceptance between both sectors. 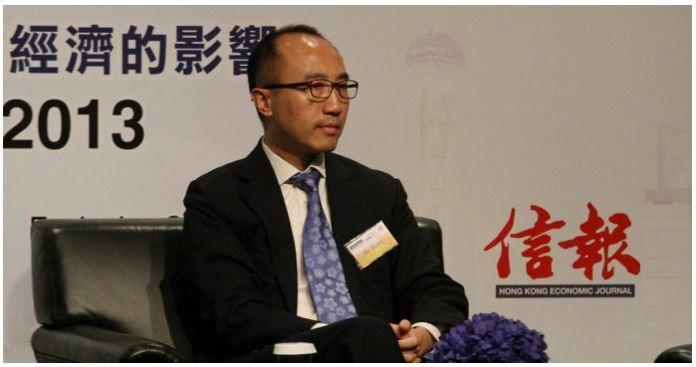 He noted that the onus now lies on the central banks to take steps that will enhance the effective coexistence of both sectors of the monetary ecosystem. This can be achieved by striving to make fiat currencies better and more stable units of account, while government authorities work to regulate the use of crypto assets. Finally, He suggests that central banks also need to make fiat currency more attractive for use as a settlement vehicle while considering the issuance of digital tokens of their own to supplement physical cash and bank reserves. While this view focuses on crypto as a means of commerce, there are other possible uses for the assets. Cryptos could become a flight to safety asset, in some ways filling the same role that gold plays in times of crises. This doesn’t mean that gold is used as a currency in times of crises although that is certainly possible. As a flight to safety asset, crypto is an asset bought by traders during a time of crisis but could be sold after the crisis eases. This is a role of gold, and the market size is significant with the size of the gold market estimated to be about $7.7 trillion. Crypto represents an even smaller slice of the money market. Around the world, central bankers have created an estimated $90.4 trillion worth of money, using data for measures of the broad based money supply. Central bankers created the money supply to facilitate commerce, as noted above. Their best estimate is that more than $90 trillion worth of money, defined as cash and other assets that can be transferred between banks in near real time, to serve that purpose. Centuries ago, there was gold backing the decisions of central banks but now the money supply is based on the best estimates of economists around the world. There is no reason that crypto could not be incorporated into these systems. 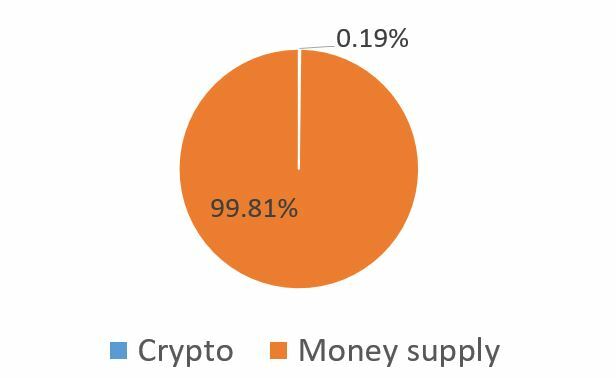 In the current environment, crypto assets are a small sliver of the size of the broad money supply. Crypto assets could increase in size through appreciation, perhaps even appreciation driven by speculation as many of the market’s critics claim. Or, the asset could increase in value as perceptions of its value and utility changes. After all, at one point, the broad money supply was an idea. It was an idea to facilitate trade among people that often lived at great distances from each other. They saw the value of the trade, and eventually, visionaries found a way to facilitate the trade. At the time, thousands of years ago, the trade was helpful in that it improved the quality of life, but an agreed upon means of exchange was needed to make those improvements possible. Eventually central banks took control of the means of exchange. Their role evolved over time and may now be under challenge. There could be an alternative to currencies available, and the alternatives of cryptos are now in use. By design, the new systems are decentralized, and the values are determined by supply and demand. The supply is determined by computer algorithms and the demand set in the market.